While drafted by the NFL’s Detroit Lions in 1948, Tittle instead signed with the Baltimore Colts of the AAFC. He had an immediate impact, leading the league in yards per attempt (8.7) and throwing for 16 TDs against 9 interceptions. After another year in the AAFC, Tittle and the Colts joined the NFL in 1950, and he led the league in pass completions (161) although the team went a dismal 1-11 and folded. Picked up by the 49ers in ’51, he gradually took over from Frankie Albert as the starting quarterback and was selected to the Pro Bowl following the 1953, ’54, and ‘57 seasons. In 1957 the 49ers tied for first in the Western Conference and Tittle also received MVP consideration. He suffered through an injury-plagued season in 1958 and, and while he bounced back with a Pro Bowl year in ’59, by ’60 found himself in competition with the up-and-coming John Brodie. With Head Coach Red Hickey committing to a shotgun offense for 1961, Tittle was dealt to the New York Giants in the preseason. Giants went 10-3-1 to finish first in the Eastern Conference while ranking second in the NFL in points scored (368) and touchdowns (46, tied with the Eagles). Lost NFL Championship game to Green Bay Packers (37-0). Tittle continued his career revival in New York, receiving MVP, All-Pro, and Pro Bowl recognition after each of the next two seasons and tossing over 30 TDs (33 and 36) in back-to-back years in 1962 and ’63. The Giants won the Eastern Conference in all three, but came up short in the title games after each. The team collapsed in 1964, Tittle’s last season. He retired as NFL career leader in pass attempts (3817), completions (2118), and yards (28,339). 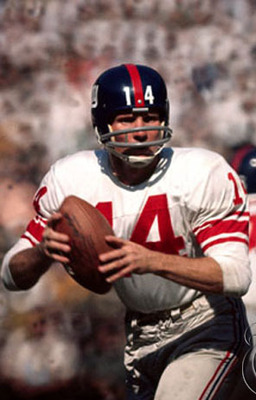 The Giants retired his #14, and Tittle was inducted into the Pro Football Hall of Fame, Class of 1971.